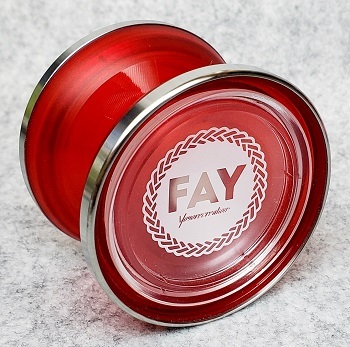 The 超FAY (超 = Chou = Super, Hyper, or Ultra), introduced in 2017, was the result of a cross collaboration effort between Yoyo Studio Llama and Yoyorecreation, both manufacturers of very high quality yo-yos in Japan. The Hyper Fay sports stainless steel rims, a size C ball bearing axle, and Yoyorecreation slim response pads. You can swap out the size C bearing for a half spec bearing and use the yo-yo with original tug response instead of a bind. This model came in clear, translucent red, and translucent blue.